A big ol pan of Chicken Pot Pie to feed a crowd! 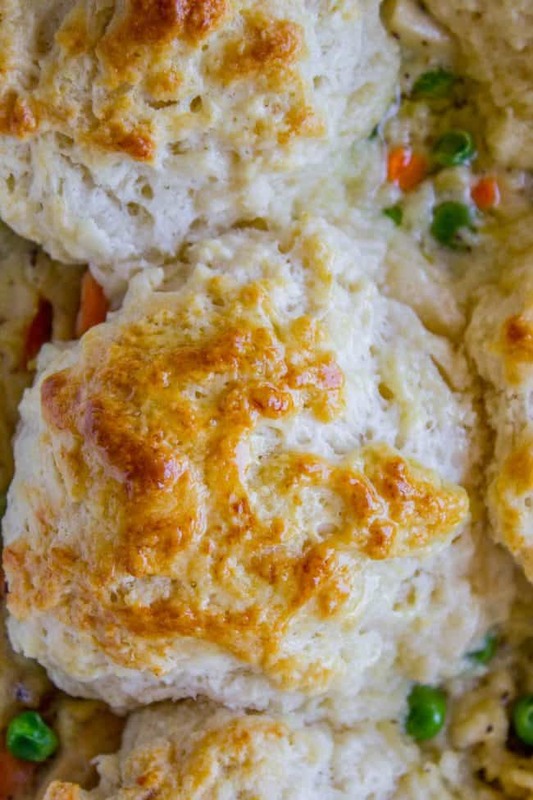 Instead of regular pie crust we’re topping them with Flaky Buttermilk Biscuits. This is comfort food at its finest! 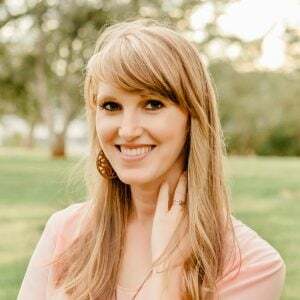 Charlotte was given a tiny Dixie cup full of dirt in her Sunday school class a few weeks ago. It had flower seeds in it. Both Eric and I thought it was crushed up Oreos at first, and were totally disappointed that we weren’t going to be able to nab some of Charlotte’s Dirt Pudding Cup. So much for that lesson on faith. No matter how much you believe, dirt ain’t gonna taste like Oreos. (Until they come out with a dirt-flavored Oreo. I have no doubt this is in the works, since I’m pretty sure Oreo knows no bounds when it comes to weird flavors. Sherbert Oreo? Watermelon Oreo? Candy Corn Oreo? What is going on? Although we’ve got nothing on Japan. My BFF Sarah just moved there (!!! military) and will get first hand experience with the crazy candy flavors they have. But back to the flower seeds in crushed Oreos. They actually sprouted into a tiny plant! I was so shocked. I’m notorious for killing living things, except my children, who are all 3 miraculously still alive. (Can I get a slow clap.) I’m really enjoying watching the little sprout grow from my station at the kitchen sink. It’s kind of healing. You guys should all plant a seed in a cup today and watch it by your kitchen sink. It’s great. 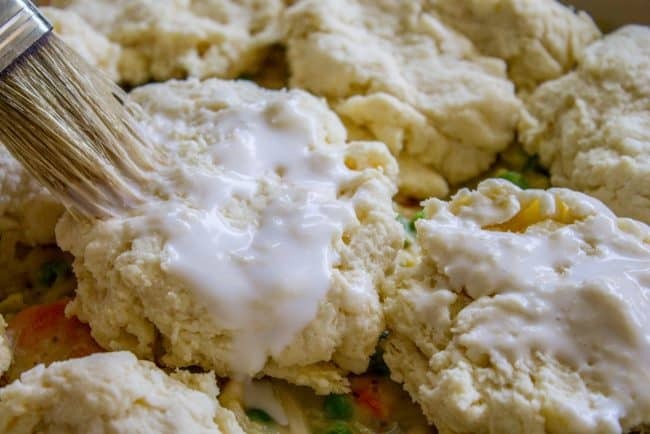 Earlier this week I posted How to Make Ultra Flaky Buttermilk Biscuits, the most tender biscuits in all the land. Today we’re taking it one step further and baking them on top of chicken pot pie filling. Tender, roasted chicken, creamy white sauce with great flavor, and carrots and peas. Ahh it’s so good. I wish I could eat this for every meal. 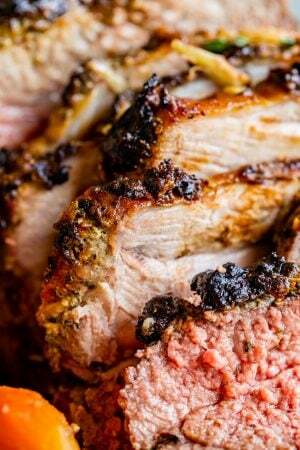 Oh wait, that’s exactly what I did this week, because this recipe feeds like 100 people so we had leftovers for days. I did a few Instagram stories making this the first time, and my friend Amelia texted me for the recipe. She somehow was able to put dinner together from this, I’m pretty impressed. Don’t worry the printable is below! This would be a great meal to bring to a new mom. Or it makes a great back-to-school meal. My kids are obsessed with it! I love when they ask for seconds on dinner. So rare, and definitely a sign of success! P.P.S. Have you guys ever heard of the Beat Scout? It’s this dude who makes amazing songs from beats he makes on random objects (chain link fences, garbage cans, tires, etc.) I’m really into the song he made for FedEx and also this one called 1-800-273-8255. In a large skillet, melt the butter with the olive oil over medium heat. When it is hot, add the onions, carrots, and celery. Saute for about 7-10 minutes, until the carrots are tender. Sprinkle with a little salt and pepper. Now we're going to make a roux. At this point you can either remove the vegetables from the pan with a slotted spoon (reserving in a bowl) or you could try my work-around. Tilt the pan to the side so that all the butter and fat is at the bottom. Push the veggies up (see photos). Add the flour to the butter in the pan. Whisk together and cook for about 1 minute to cook out the flour taste. Pour the chicken broth VERY slowly into the flour, keeping the pan tilted. Pour a little bit, then whisk so that the liquid is absorbed, then stir some more. Take your time, you don't want lumpy sauce. Once you have added all the broth and have a nice white sauce, you can stir the vegetables together it. Season with 1 and 1/2 teaspoons salt, 1 teaspoon pepper, and 1/2 teaspoon celery seed. Cook, stirring occasionally for 3-4 minutes, or until it has reached a thicker consistency. Stir in the chicken and frozen peas. Turn off the heat. Pour the mixture into a 9x13 inch casserole dish. Separate the dough into 12 pieces and flatten them a little bit with your hands into a rough disc. It doesn't need to be perfect, and don't go too crazy, you want them kind of thick. (But not dome-y.) See photos. Place each biscuit on top of the chicken mixture in the 9x13 pan. Brush each biscuit with buttermilk or milk. Bake at 400 for 25-30 minutes. 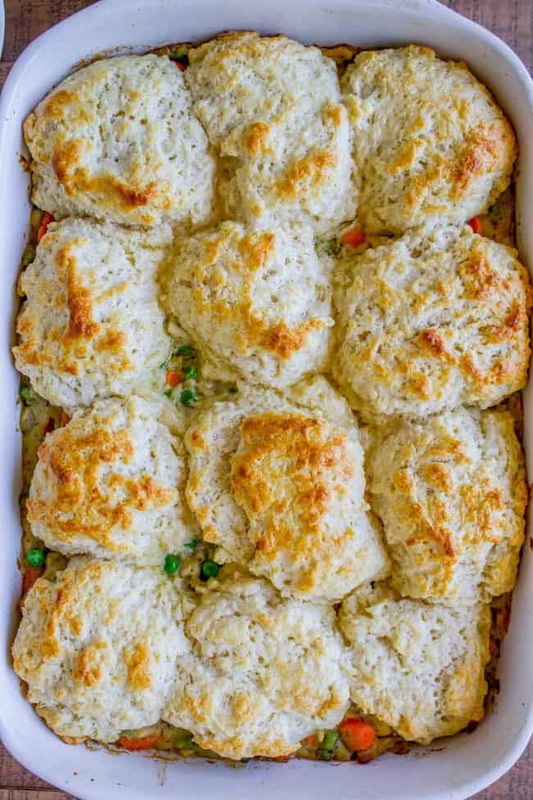 The tops of the biscuits should be golden brown and the casserole should be bubbly. *I always use water + this chicken base that I always keep in the fridge. You can find it in the grocery store. 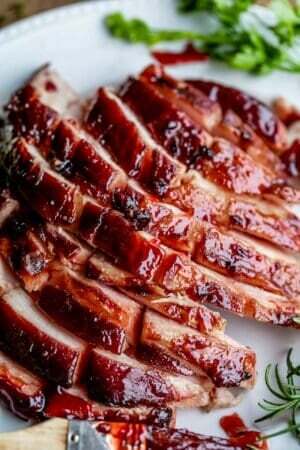 For this recipe, I used 3 cups of water and 1 tablespoon chicken base. 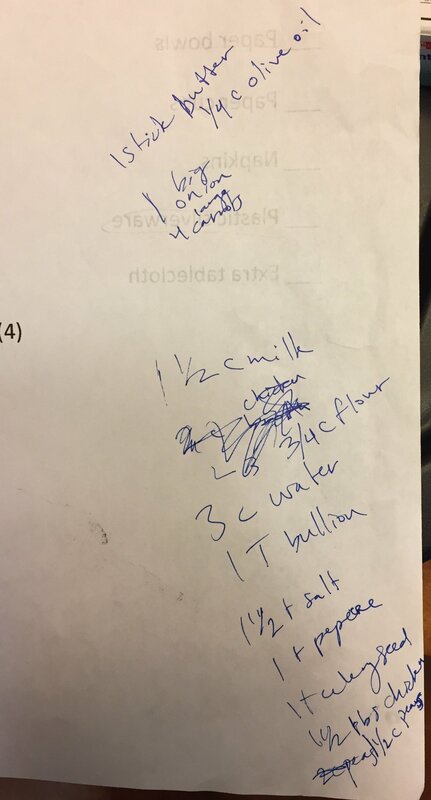 **This is my homemade biscuit recipe. 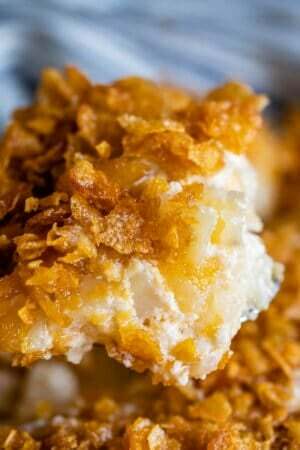 They are amazing, so tender and flaky. They totally make this casserole next level. BUT. Pillsbury biscuits from a can will also work, or you could make Bisquick biscuits. Sometimes you just need to get dinner on the table! 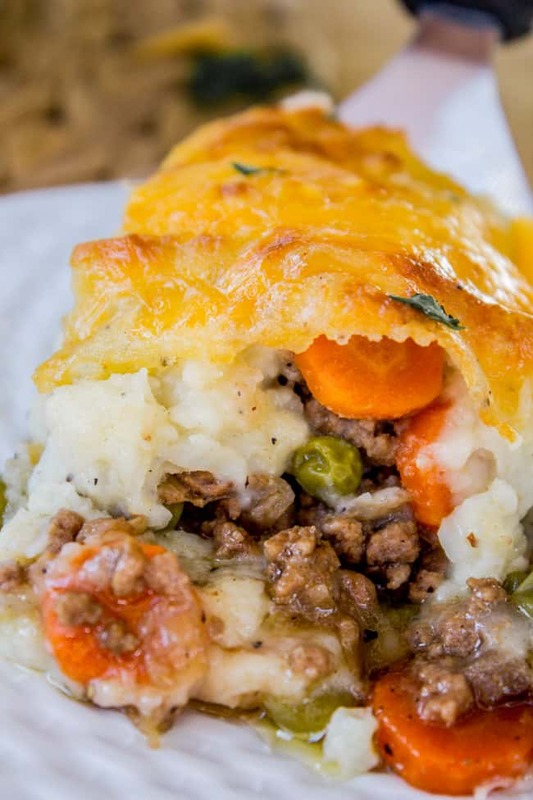 Classic Shepherd’s Pie with Crispy Cheddar Topping < technically this is a Cottage Pie because it’s made with beef. People on the internet get really mad about stuff like this. I’m over here like, call it whatever you want, just make sure you invite me for dinner guys. 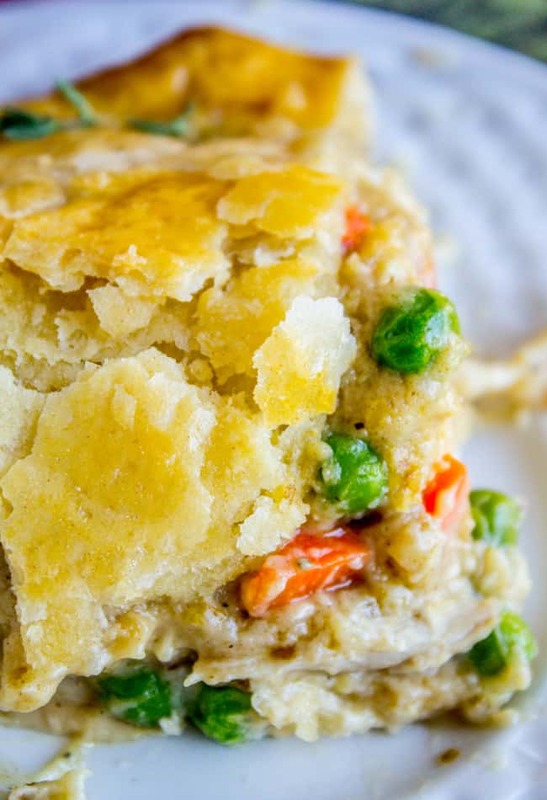 Classic Double Crust Chicken Pot Pie << I based today’s recipe on this one. So, so good. 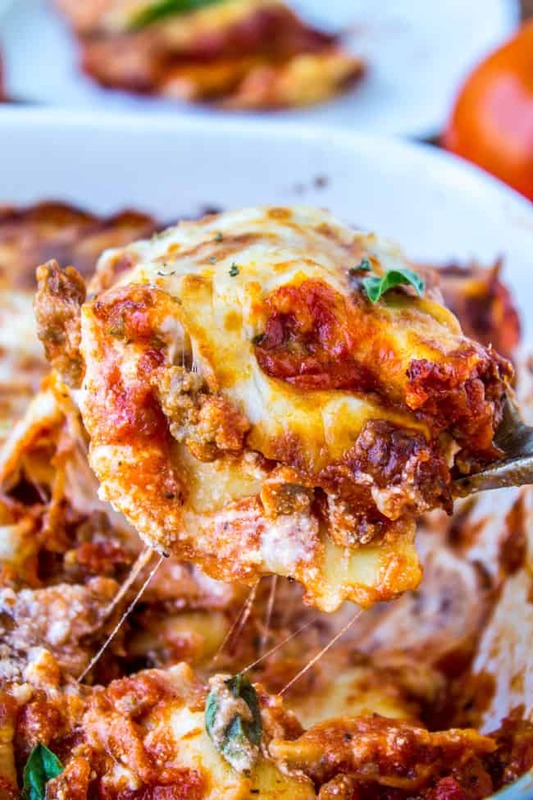 Easy Cheesy Ravioli Lasagna << an old classic. More Chicken Pot Pie ideas! 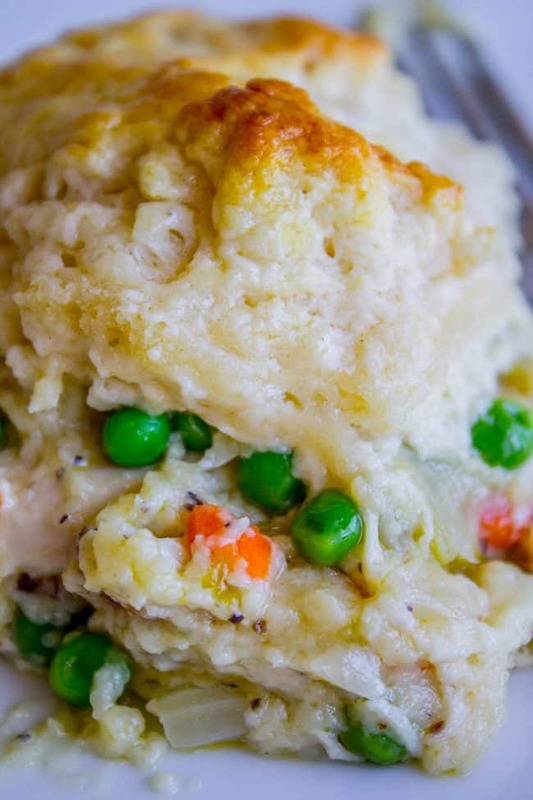 Delicious recipe, much better than any pot pie I had growing up! I used my own mix of veggies and turkey, and ended up with enough filling for another half pot pie. I put in the freezer (with a few biscuits) so now I have an easy dinner for the future! Oh Theresa, I’m interested in my time too ;) and have totally used pillsbury in a pinch. I’m so glad you liked how it turned out. Thanks for reviewing! Amazing dish! Love the biscuit topping and can’t wait to try and make the biscuits by themselves. They were delish on top! Thanks for the recipe, saved in my favourites! Hey Sherri, I’m so glad you got a chance to try out the recipe! Can’t go wrong with chicken and biscuits :) Thanks for the review! Ha! 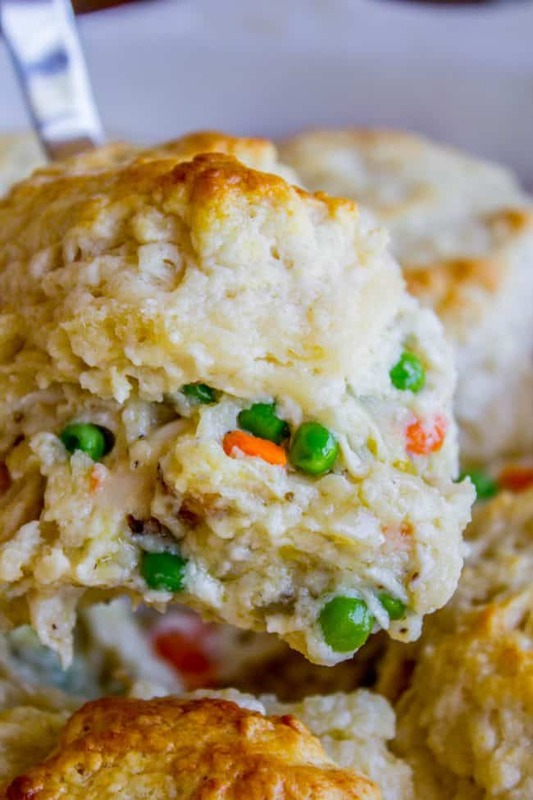 With your chicken expertise and my biscuit expertise, we might just make the most perfect Chicken Pot Pie!! Thanks for commenting Jana, I’m glad you liked it! And you HAVE to try the French Silk Pie. SO GOOD. 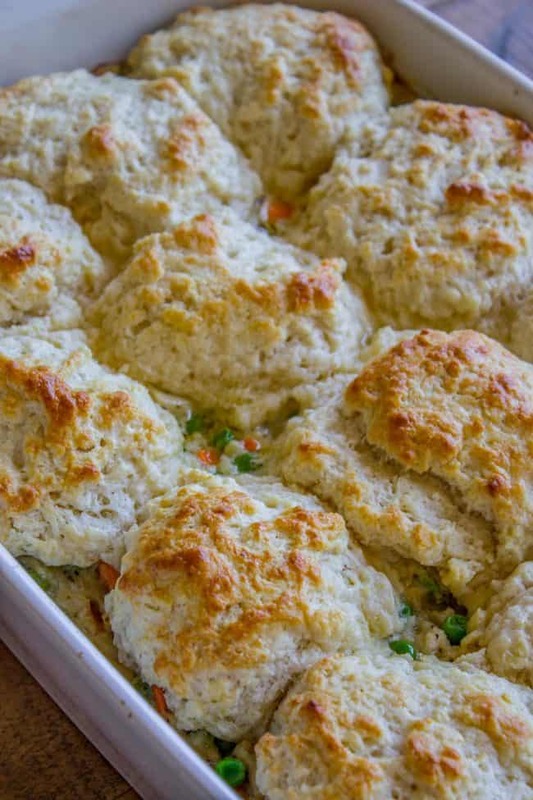 OMG I legit was just scratching my head wondering what to top my Chick pot pie with tonight since naturally I have no pie crust – BISCUITS! GENIUS! Thanks lady! Biscuits are the best!! Thanks so much Kate! I made this for dinner tonight and my family RAVED! My wife said it was the best chicken pot pie she’s ever had! She told me to please make it again, anytime! Thank you so much for an easy, delicious recipe! I’m so happy to hear that Jen! It is the best when you find a recipe the whole family enjoys!! Thanks for coming back to comment, it always means so much to me! I made the chicken pot pie, with a whole chicken I’d made, smeared with butter s&p, lemon juice, & rosemary under the skin. I was freaking out about making the biscuits and no buttermilk so I made the jiffy corn bread mix on top. It was 5***** & husband loved it! I never thought I could make a chicken pot pie, but it was easy-with your recipe, and delicious! I even took pictures & shared them with my class. Now they are following you and want to make your molten lava cake, haha! Wow you made your own chicken!! So impressive. I’ve never roasted a whole chicken before, eee!! shhhhh! I’ve even done a turkey at Thanksgiving but no chicken. the ones at the store are just soooo easy. Mad props to you. 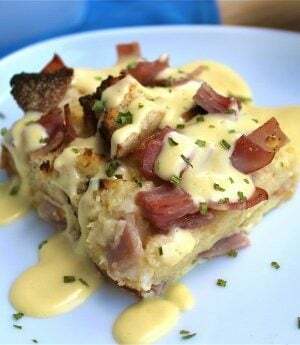 i LOVE the cornbread idea, that would be delicious! Thanks for sharing my blog Jana! Karen, the bed is simple and cute. It seems like you’d enjoy being able to sit up against the soft backing? How fun, I bet your class will love it! Everyone needs to have a good comfort food recipe like chicken pot pie up their sleeve :) And I’m glad you like the bed, thanks for chiming in! Yes I wanted something that would be comfortable to lean back on. We ordered it yesterday, there are some awesome labor day sales going on! Super excited! Now I know what we are having for dinner tonight! I roasted a chicken on our brand new Trager Grill (which is fabulous! -we have 3 grills now, a big Weber gas grill, a huge ceramic Vision and now a Traeger. 3 grills for 2 people – something’s wrong with this picture. Can you say “rampant materialism”?) and I have a bunch of leftovers. I’m going to half this recipe and put it in an 8×8 pan. Thanks Karen! There are never too many grills Kris! Haha okay actually, more grills than people might be pushing it. I’m so impressed that you roasted your own chicken. I’m way too lazy and I think I will be as long as Costco sells them for 4.99. Good idea halving it!